On 5th April, I attended the oral hearing of the Court of Justice of the European Union (CJEU) on the draft agreement between the EU and Canada on the transfer, use, and retention of air passenger data (EU-Canada PNR agreement). The European Parliament has submitted this agreement to the Court in November 2014. It was my first time at the Court, and the Grand Chamber is really impressive. However, I watched the hearing from the press room next door in order to be able to use the laptop and wifi. Colleague Thomas van der Valk was also tweeting. EU Court of Justice hearing on EU-Canada PNR agreement about to start. I'll tweet from there. #CanadaPNR hearing started. First: legal service of @Europarl_EN, which submitted the agreement to the Court.
.@Europarl_EN: 2 questions: lack of data protection rights, wrong legal basis of the agreement. Candadian law only allows Canadians remedy.
.@ThmsvdVlk is also live-tweeting from the #CanadaPNR hearing at the #CJEU.
.@Europarl_EN: Article 47 of the Charter (judicial redress / legal remedies) not met with the PNR agreement?
. @Europarl_EN: Article 52 of the Charter (proportionality and necessity) not met either, see #dataretention judgement?
. @Europarl_EN: systematic analysis of all passenger data (profiling) not yet covered by #CJEU case law such as #dataretention or #Schrems. Now: Council legal service, defending the #CanadaPNR agreement. "@Europarl_EN also accepted PNR agreements with USA and Australia." Council: Legal basis for #CanadaPNR agreement (Art. 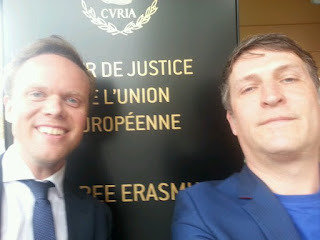 82 TFEU, judicial cooperation) is correct, we maintain our position.
.@EUCouncil conclusion: All is fine with the #CanadaPNR agreement.
.@EU_Commission: #CanadaPNR agreement provides for legal remedies and independent oversight: Passengers can complain with EU DPAs. Estonia: #CanadaPNR data is limited. Helps police to determine criminal intent of travellers. #Schrems not comparable, based on 1995/46/EC. Estonia: No reason to believe that Canada would process data without good faith. #CanadaPNR will pass #Schrems "eye of the needle" test. Estonia: We cannot allow the risk of having potentially dangerous people board airplanes. #CanadaPNR is "unavoidably necessary". Now Ireland on #CanadaPNR: International problems demand international responsed. Agreement is necessary. Ireland: @Europarl_EN has agreed to PNR agreements with USA and Australia! Ireland: @Europarl_EN is endangering international cooperation by its challenge of #CanadaPNR. Next in #CanadaPNR hearing is Spain: We must regard the specific circumstances of the #CanadaPNR case. After short break, now France on #CanadaPNR: Canada provides essentially equivalent data protection rights. PNR data not intrusive anyway. France: Judicial approval of transfer of #CanadaPNR data would make the whole approach meaningless. Agreement necessary and proportionate. UK: Vast majority of #CanadaPNR data will never be subject to human review, only sifted through by computers. UK attacks @Europarl_EN legal service agent: "His assertions about Canadian law are just wrong". UK repeats @EU_Commission: Critical report by Canadian DPA shows that independent oversight works. #CanadaPNR.
.@EU_EDPS Art. 5 of #CanadaPNR agreement presumes adequacy for Canada without additional safgeguards. No judicial remedy for Europeans.
.@EU_EDPS: Use of #CanadaPNR data is about predictive policing, based on abstract definitions of what is "suspicious" & big data. Like US.
.@EU_EDPS Profiling of #CanadaPNR similar to "Rasterfahndung" (pattern searches) in DE after 9/11. Ruled out by consitutional court in 2006.
.@EU_EDPS dissects claims by Member States & Comission about oversight in #CanadaPNR. Not equivalent to independent authority, EU DPAs out. 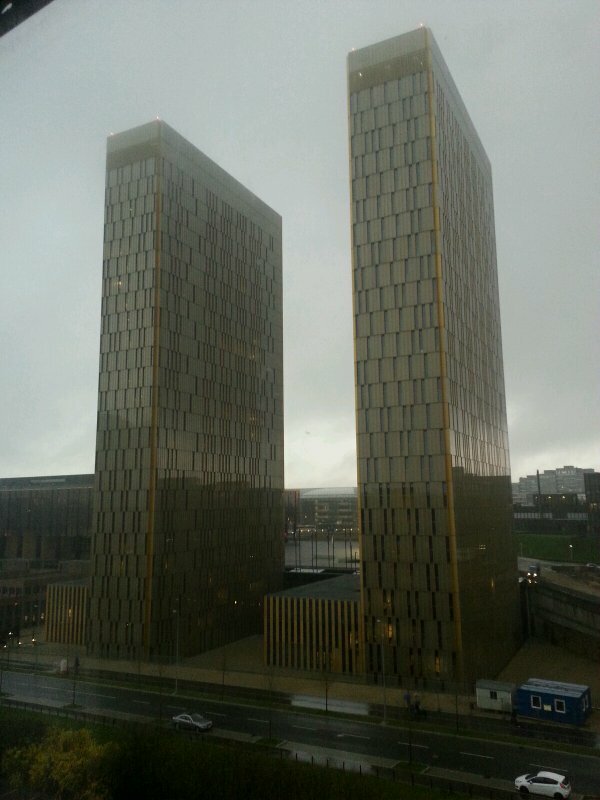 Statements in #CJEU #CanadaPNR hearing are over. Thomas von Danwitz, judge rapporteur, now summarising for Q&A. Danwitz: Passengers are not informed about collection & consequences when they book a flight. Therefore, #CanadaPNR implies purpose change.
.@EU_Commission: "As Article 11 of #CanadaPNR provides..." Danwitz: "We're still at the travel agency now, not in the agreement!" Danwitz: DRI judgement requires clear guarantees for data subjects. Should #CanadaPNR data categories be clarified by law, not in annex? Danwitz: What does "etc." stand for in point 5 of #CanadaPNR agreement? Is that sufficiently precise?
. @Europarl_EN lawyers are cracking up in the background. Danwitz now really grilling @EU_Commission on the #CanadaPNR annex. They already have two agents at the bar in order to deal with it. Danwitz: That's not my question. My question is about precision of the annex of #CanadaPNR, and "mandatory" vs "optional" data. Inequality? Danwitz: Nothing in the #CanadaPNR agreement limits databases for cross-checking to Canadian databases. Is that correct?
. @EU_Commission: Data is used for profiling first, only suspicious data compared with other databases. Danwitz: It's not in the agreement! Danwitz: The @EU_EDPS asked you to exclude sensitive data. No explicit exclusion in #CanadaPNR agreement, however. Reason (except "useful")?
. @EU_Commission: See Article 8. Danwitz: Hmh, ok.
Danwitz: Why do you not demand statistics in #CanadaPNR agreement, as in the EU directive? . @EU_Commission: Canadians still do statistics. #CJEU #CanadaPNR hearing has started again. @EU_Commission to answer question from before lunch - "should we all be subject to surveilance"? Danwitz: Does the data "stigmatise" everyone or just some? That's the question. #CanadaPNR. Now questions from AG and other judges. Now Paolo Mengozzi, advocate-general for this case, with questions on the legal basis of #CanadaPNR. "COM can rest, but just for a bit"
Council legal service on special carve-out protocols for UK, Ireland and Denmark on judicial cooperation. Q: Have they voted on #CanadaPNR? AG Mengozzi: "This seems absurd to me." Chance for survival of #CanadaPNR getting slimmer by the minute.
.@Europarl_EN: We think it's data protection (Art. 16 TFEU), but could be both. One reason we submitted #CanadaPNR to you. Mengozzi: Article 4(1) of #CanadaPNR: "EU shall ensure air carriers are not prevented from transferring PNR data" But there are limits!
. @Europarl_EN: Look at Art. 5 #CanadaPNR: Canadian authoriy "is deemed to provide an adequate level of protection" - problematic! UK lawyer by far with strongest and most well-informed arguments in favour of #CanadaPNR. Must be the wig. UK: WHole purpose of #CanadaPNR is to ensure that Canada has equivalent protections. Not to install EU DPA oversight over Candian DPA. Advocate-General Paolo Mengozzi will present his opinion on #CanadaPNR on 30th June. Session is closed.